Reveal your spectators star sign, no guessing... Every time! Imagine being able to tell your spectators personal information when you have only just met. Picture being able to take this further, your spectator will feel like you are reading their mind as you amazingly reveal their star sign. This is HoroSecrets! This is strong, personal and correct every time. Are you concerned this will be difficult? Don't be because it is so simple! 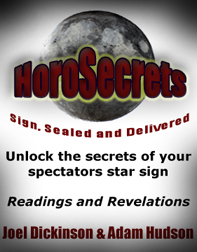 HoroSecrets can be used as a tool for professional performers wishing to introduce mentalism or readings into their performances. Also note, you can use HoroSecrets as a stand alone star sign revelation or incorporate it in to existing routines. Suitable for magicians, performing mentalists and mind readers.